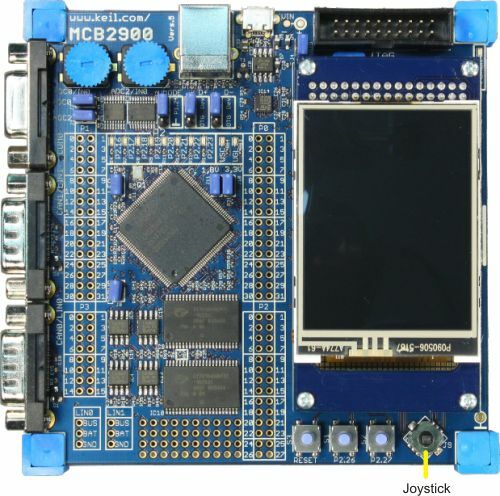 The 5-position joystick control on the MCB2929 board grounds one of 5 possible port pins depending on how the the joystick control handle is positioned. The control may be positioned left, right, up, down or pushed toward the board (select). The Left joystick position connects pin A to port pin P0.28 of the LPC29xx device to ground. The Right joystick position connects pin D to port pin P0.30 of the LPC29xx device to ground. The Up joystick position connects pin B to port pin P0.29 of the LPC29xx device to ground. The Down joystick position connects pin C to port pin P0.31 of the LPC29xx device to ground. The Select joystick position connects the CE pin to port pin P0.26 of the LPC29xx device to ground.